No hotel celebrates the Easter weekend like the Goa Marriott Resort & Spa. I spent the last Easter weekend surprising my family to a delectable array of chocolate eggs, cakes, bunnies and more at AZ.UR, the cafe and lounge with light bites. It was the closest experience we’d ever had to an authentic Easter Day celebration. The fun filled Easter egg hunt, the Easter breakfast casserole and the attention to minute details in terms of the décor was just perfect. Our Easter celebration came to a full circle with the Easter Sunday Brunch at Waterfront Terrace & Bar. The restaurant offers a gourmet menu of traditional delicacies and boasts lavish buffet spreads serving a blend of Indian, Pan-Asian & Continental cuisine. The carefully created menu at Waterfront Terrace & Bar was the most festive Easter meal one could ask for. The team of chefs at Goa Marriott Resort & Spa enticed us with their luxurious Easter Sunday Brunch, showcasing assorted seafood on ice, live food stations and Easter favourites. Highlights from the special menu included Honey Glazed Carrots, Classic Deviled Eggs and Mac n Cheese. Moreover, we were spoilt for choice with their selection of sweet indulgences like Carrot Cream Cheese Cake, Chocolate Fountain with Fruits and Chocolate Easter Eggs. Our kids just couldn’t get enough of the celebration at the hotel. They refused to head home after the indulgent Brunch and insisted on hitting the Swimming Pool for a dip. We immediately gave into our kids’ demand as we knew our Club Marriott membership entitled us to a 50% off on use of the Swimming Pool area throughout the membership year. As always, our Club Marriott membership brought more joy to our dining experience. We used our Club Marriott card to receive a 30% off on the total food & beverage bill and saved Rs. 2400 on the total bill amount of Rs. 8000. I’m eager to hit the hotel to enjoy their ‘Eggsciting Easter Brunch’ this year as well. This year’s holiday celebration includes a hearty brunch with live band performances to uplift the festive spirit. Unlimited flow of beverages, on-the-spot prizes followed by a frolicsome Easter Egg hunt for kids and a range of other fun activities is surely going to make it a grand celebration. The only thing that sounds more exciting than the event itself is that Club Marriott members can avail a special 20% off on the Easter promotion. So, hop on over to purchase a Club Marriott membership to enjoy the Easter weekend at a Marriott hotel near you. Club Marriott offers exclusive benefits at over 300 participating Marriott hotels and resorts across Asia Pacific. Enjoy up to 30% off on the food and beverage bill, group dining offers for your special occasions, special accommodation rates, night stays and access to a range of hotel leisure facilities. A healthy lifestyle has always been a huge part of my life. However, eating healthy often becomes a challenge with the numerous business meetings and casual socialising over the weekends. It’s very refreshing to see a global leading hospitality brand like the Westin Hotels & Resorts to understand the importance of eating healthy food and focus on signature wellness programs that empower you to eat, sleep, move, feel, work and play well, so you can be at your best while on the go. Purchasing the Club Marriott membership valid at The Westin Gurgaon, New Delhi has not only helped me save money but also move towards a healthier lifestyle in many ways. The Westin Well-Being Movement, that encompasses programs across Westin’s six pillars of well-being – Sleep Well, Eat Well, Move Well, Feel Well, Work Well and Play Well, promotes a comprehensive approach to a healthy lifestyle. From the world-renowned Heavenly Bed and nourishing SuperFoodsRx dishes to the energizing WestinWORKOUT, RunWESTIN and Westin Gear Lending with New Balance, amongst other initiatives, every element of a guest’s stay is designed with their well-being in mind. During my last visit to the hotel, I used the Club Marriott room night stay certificate to avail a room night stay at no extra cost. The certificate was inclusive of buffet breakfast. As we entered Seasonal Tastes, we witnessed a splendid breakfast buffet featuring eggs, waffles, baked items, fresh fruit, cereals, and much more. Since I wanted to make healthier food choices, I asked the staff about a healthy diet menu and was informed about the SuperFoodsRx menu, The Westin Eat Well menu for Kids and the Fresh Juicery. As part of my conscious food choice to stay healthy, I ordered egg whites and nuts from the SuperFoodsRx menu and was thoroughly impressed. Club Marriott members can indulge in the SuperFoodsRx menu to combat current health issues and reap the benefits of eating healthy. As a Club Marriott member at The Westin Gurgaon, New Delhi, enjoy a 30% off on the food and beverage bill for up to a maximum of twenty (20) guests at the restaurants, up to a 50% off on the food and beverage bill for up to a maximum of ten (10) guests at Seasonal Tastes every Monday and Tuesday, buffet meal(s) for two, room night stay(s) and other benefits on accommodation. With Club Marriott, wellness doesn’t just end at food, the membership also offers a range of health and spa certificates for a healthy mind and body. The health and spa certificates entitle the Member to day use/access of the Swimming Pool area from Monday to Friday for a family of two (2) adults and two (2) children, 50% off on a select massage treatment and more. Still haven’t thought of the perfect way to celebrate Holi this year? Fret not. Club Marriott’s got the answer for you. As a Club Marriott member, you have the world at your fingertips, with special offers, select access to leisure facilities, and exclusive privileges at over 300 participating hotels and resorts across Asia Pacific. Come in and enjoy a scrumptious meal, complete with all your traditional festive favourites at the hotel’s Holi Hangover Dinner. For any assistance or clarification, do call the Club Marriott Help Desk at +91 20 6721 0052 / 3, email at westin.pune@clubmarriott.in or click here to reserve. To celebrate the true spirit of one of the most vibrant and colourful Indian festivals, experience a special Holi brunch featuring delicacies including the much loved gujiya, masala kachori, paneer malpua, thandai and more to offer. For any assistance or clarification, do call the Club Marriott Help Desk at +91 720 709 2772 / 773 / 774, email at westin.hyderabad@clubmarriott.in or click here to reserve. Make this Holi more joyful than ever. Indulge in our splash at Waterfront Terrace & Bar with a spread of colourful, aromatic & delicious preparations, curated specially for the occasion that would satisfy every palate. For any assistance or clarification, do call the Club Marriott Help Desk at +91 832 6647 220, email at marriott.goa@clubmarriott.in or click here to reserve. Revel in the colours of Holi with an exquisite lunch featuring North Indian delicacies crafted by Chef De Cuisine Rajan. For any assistance or clarification, do call the Club Marriott Help Desk at +91 20 6683 3322 / 23, email at jwmarriott.pune@clubmarriott.in or click here to reserve. Enjoy colourful delights at Indore Marriott hotel as you indulge in the most vibrant Holi Brunch. For any assistance or clarification, do call the Club Marriott Help Desk at +91 73147 77715 / 16, email at marriott.indore@clubmarriott.in or click here to reserve. Celebrate the festival of colours with exquisite taste at the Holi Brunch at MoMo Café. For any assistance or clarification, do call the Club Marriott Help Desk at +91 79 6618 5032 / 33, email at courtyard.ahmedabad@clubmarriott.in or click here to reserve. Experience the beauty and vibrance of Holi with an auspicious dinner at MoMo Cafe and enjoy a host of authentic dishes from across the nation. For any assistance or clarification, do call the Club Marriott Help Desk at +91 771 4330 023 / 24, email at courtyard.raipur@clubmarriott.in or click here to reserve. Paint your palate with hues of flavours and revel in festivities with our Holi Lunch, relishing a lavish spread especially curated for the colourful celebration. For any assistance or clarification, do call the Club Marriott Help Desk at +91 22 6136 0610, email at courtyard.mumbai@clubmarriott.in or click here to reserve. This is exactly what I had been waiting for. Club Marriott membership is finally valid at The St. Regis Mumbai. Even though I’ve been a member at various luxury hotels over the past few years, I had always wanted to be a member at The St. Regis Mumbai. The St. Regis Mumbai defines luxury in the city like no other. The 38 floor building is not only India’s tallest hotel building but also houses my favourite restaurant, Seven Kitchens. Perched on the top floor, the all-day dining venue, welcomes guests with captivating views and bright natural light that showcases an expansive buffet of celebrated international offerings and, on Sunday, a destination brunch. Knowing my new Club Marriott member status and appreciation for Seven Kitchen, it wasn’t a surprise for my girl gang when I recommended the restaurant for our monthly catch up session. The membership entitles members to a certificate offering a 25% off on the Special Ladies Luncheon up to forty ladies on a table at Seven Kitchens. The luncheon was decked with a lavish spread of gourmet salads, cheeses, wood-fire pizzas, pasta, steamed dumplings, wok-fried noodles and more. What’s really special about this particular membership is that it’s not just about dining, accommodation or lifestyle benefits; it also focuses on offering exquisite experiences to its guests. The St. Regis is known for its iconic Afternoon Tea. Tea is something I’m extremely fond of, so I took the first opportunity I got to experience the service myself using the Club Marriott from The St. Regis Mumbai’s certificate offering a 30% off on The St. Regis Afternoon Tea. The experience let us indulge in exquisite creativity through the Art Tour and gave our taste buds a real sense of pleasure with a range of culinary snacks, desserts, a range of Indian teas and flavoured coffees. With an option to choose from over 10 brews, the tea service was quite impressive. I particularly liked the Darjeeling Secind Flush paired with freshly baked raisin scones with homemade preserve and clotted cream. Club Marriott’s latest offering in the city also gives its members guest list access to highest night club in Mumbai. Set on the 37th floor, XXO lets one enjoy a panoramic view of South Mumbai & Arabian Sea with the city’s elite crowd till 3:00 am. Now I’m on the hunt for the perfect occasion to be celebrated with this one of a kind experience. I can’t wait to experience all that this membership has to offer throughout the coming year including up to a 50% off at the restaurants, celebration cakes and wines, room night stays at the hotel, a room upgrade, access to the Athletic Club, a 15% off at the Iridium Spa and more. Club Marriott’s got great news for members across the country. Members can now enjoy a 15% off across 9 food and beverage venues and a 10% off on the Best Available Rate on the base category of rooms at The St. Regis Mumbai. The Westin Kolkata Rajarhat opened its doors to guests in 2017. With the opening of The Westin Kolkata Rajarhat, Kolkata welcomes its first Westin property in the heart of the business city. Operated by hotel giant, Marriott International, the hotel is the second Marriott hotel in the city. Committed to The Westin’s focus on well being, The Westin Kolkata Rajarhat emphasises on wellness through specially dedicated programs. For instance, the Run Westin program, highlights running trail in the vicinity and the Gear Lending Program takes care of fitness gear. The Westin Kolkata Rajarhat also brings Westin’s signature dining experience to the city for the first time ever. Overlooking the city landscape, Seasonal Tastes’s global menu is well designed using super foods like avocado, wild salmon, walnuts, apples, soy and oats. The Westin Kolkata Rajarhat is making it’s way to be a part of the Club Marriott program. It will give members the opportunity to avail lucrative dining, stay and lifestyle discounts. 20% off on select services at the Salon and the Spa. 20% off on the Best Available Rate on the base category of rooms. Member’s Day on Wednesdays – Avail a 50% off on the total food bill and a 30% off on the total beverage bill up to a maximum of eight (8) guests at Seasonal Tastes. One (1) certificate entitling the Bearer to a 100% off on a one night stay in the base category of rooms. Two (2) certificates entitling the Member to a 50% off on select therapy treatments at the Spa. Enrol yourself in the newest loyalty program in Kolkata and open the door to a range of benefits to enhance your lifestyle. Over the past year I’ve thoroughly enjoyed using my Club Marriott membership at JW Marriott Hotel Bengaluru. Complimentary meals, stays and kid’s centred activities, they’ve got it all. Not just JW Marriott Hotel Bengaluru, the membership also lets me enjoy a couple of benefits during my weekend stay at the near by Sheraton Grand Bangalore Hotel. • Up to a 20% off on the food and beverage bill at the restaurants for up to a maximum of ten (10) guests. Savings on premium wines and spirits at select hotels. • Up to a 20% off on the Weekend Best Available Rates. Our travel itinerary included Sydney, Gold Coast and Melbourne, and luckily enough we found a participating Marriott hotel at each of our destinations where the Club Marriott discounts were available. We spent a total of 2 weekends in Australia and were able to avail the 20% discount on the Best Available Rate on rooms on both occasions. Keeping that aside, we got a 20% on each meal we consumed at the hotels and let me tell you that this accounted for a huge part of our total saving. The benefits we availed during our trip were far more valuable than the card itself. I’m so glad to have purchased the membership in the first place and then to have planned my trip ‘Down Under’ with it. 10 years! My wife and I completed a milestone in our marriage and planned a special staycation to celebrate our special day. We bought the Club Marriott membership and headed to the JW Marriott Mumbai Juhu. Here’s a rundown of the amazing benefits we availed during our staycation and you can too! Complimentary room night stay – Level 3 of the Club Marriott membership at JW Marriott Mumbai Juhu got us a free room night stay in a Suite. It possibly had the greatest view one could get while sitting by a window in a hotel room – a view of the hotel’s pool, palm trees and the infinite beach. It was a view worth a million bucks. Staying in a Suite came with extra perks like access to the Executive Lounge, where we enjoyed several conversations while we sipped martinis and binged on finger food. Lunch for two at Lotus Café – With a choice between Indian, Italian and Asian, we enjoyed one of the best buffets in Mumbai at absolutely no cost. With views of the blooming lotus pond, our complimentary buffet lunch was nothing short of scrumptious. The membership also got us a 30% discount for all our other meals at other restaurants of the hotel – Dashanzi, Mezzo Mezzo and Saffron. Complimentary Wine – On the day of our anniversary, we decided to dress up and go to Dashazi for a romantic meal where the Club Marriott membership card entitled us to a 30% off on the total food & beverage bill. We ordered the vegetarian dimsum basket to get the most of their overwhelming dimsum menu of over 15 kinds. To top the already decadent meal, I used the certificate offering a complimentary bottle of house wine to surprise my wife and to raise a toast to the wonderful life we’ve spent together. 50% off at the Spa – No staycation is complete without a relaxing massage. Quan Spa is one of the better spas in Mumbai, using two off the five certificates available at the Spa, we got one 60 minute full body massage each. Our spa certificates helped us both get massages for the price of one. This is all we could pack in our one day short trip. However, there is so much more the Club Marriott membership offers at the hotel – 20% at the Salon and Bakery, 50% off on the laundry service, up to a 50% off on room rates and complimentary access to the pool and services at the Salon. My husband has had a Club Marriott membership issued by The Westin Gurgaon, New Delhi for some time now. The membership also came with a Club Marriott spouse card that I never thought much about. One day I was chatting with my husband, asking him to recommend a good place for me to host the next Kitty Party. He suggested The Westin Gurgaon and asked me to go through the bunch of certificates that came along with the membership. It’s only when I went through the certificate booklet that I discovered the 50% off on dining and 30% off on beverages certificate applicable on large tables, just ideal for our Kitty Party – the monthly girls only outings, cozy lunches and fun-filled evenings. So, I lured my friends into visiting The Westin Gurgaon and it turned to be the best Kitty lunch we had experienced in a while. It was an afternoon full of amazing food, drinks, tambola and some harmless gossip as we enjoyed the winter sun by the pool. My Kitty gang is a health-conscious bunch, always on the lookout for the healthiest food options. The salad bar at Seasonal Tastes was something we thoroughly enjoyed and the steamed dim sums were a close second. Usually dessert is something we skip, but the delectable choice presented at the hotel made it difficult for us to pass. To top it all, the entire bill amount was halved and it came down to be a bit lesser than what we were used to paying at stand-alone midscale restaurants. Thanks to my husband’s membership card, we enjoyed a meal at a luxury hotel instead of a midscale restaurant while paying pretty much the same amount. The Club Marriott experience didn’t just stop at their dining benefit, there was more to follow! The hotel staff was kind enough to suggest and organize a mini spa session for the ladies. The Club Marriott membership offered deals at the spa too. The Club Marriott membership was a hit in our group and we have tried to use it to get benefits at our successive Kitty lunches. Tuesday is Club Marriott Member’s Day and the hotel offers a 50% discount on dining. We had used all certificates offering discounts on large tables and was not hosting the next Kitty anyway, however my membership card worked and got a discount on our food and beverage bill. As I sat there enjoying my time with my friends, I noticed that the restaurant had a few other Kitty Party groups as well, possibly enjoying the same Club Marriott benefits. It seemed as though we had adopted the trend of using a membership card for a Kitty very late. Once we started using the membership for our Kitties there was no looking back! Once we started using the membership for our Kitties there was no looking back! We planned a weekend Kitty Getaway in Jaipur, the room benefits worked wonderfully well at the new JW Marriott. What a wonderful hotel! We had an absolutely relaxing and indulgent weekend. We have already used the card to get discounts at the JW Marriott @ Aerocity and Le Méridien New Delhi. We are now planning to use the card at Le Méridien Gurgaon. So many hotels and one card. It offers incomparable experiences at multiple hotels and does not cost that much either. We even recovered the membership fee by the discounts we got on our 1st lunch. Go, get one for yourself too. It was time for one of my closest friends to get married and I had the most difficult task of finding the perfect wedding gift for him. I was sure that I wanted to get something that both of them could enjoy instead of something for their house or a gift item just for him. I racked my brain to think of the best gifting options and zeroed in on a hotel membership. My friends are fond of good food, good wine and good travel, hence there couldn’t have been a better gift for them considering their lifestyle. I thought each time they used the membership, they will spend time together, enjoy the luxury hotel experience and will have a lot of good memories thanks to my gift. And it worked. I asked a few other friends who frequently visit hotels to help me choose one membership from all the loyalty programs available in the market. The recommendations made it clear that I should pick a membership that is close to their home. They stay in Powai and the finest hotel complex near by was the Renaissance Mumbai, hence the answer was simple, the highly recommended Club Marriott membership. 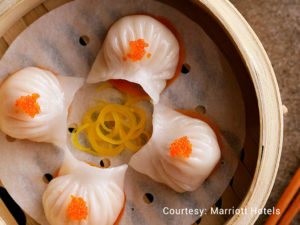 This is the food and beverage loyalty card from Marriott offering benefits at more than 250 Marriott hotels with over 1,000 restaurants across Asia Pacific. I got them the membership from Renaissance Mumbai Convention Centre Hotel fetching them a complimentary room stay, buffet breakfast, buffet lunch or dinner, chocolate cake, a bottle of House Wine and a huge line up of other discounted services. Due to the proximity to their home, I was hoping they’d be able to get full use of the membership benefits through frequent visits. Besides the Renaissance, Mumbai has four other gorgeous Marriott hotels at which participating hotel discounts can be availed – The Westin Mumbai Garden City, JW Marriott Mumbai Sahar, JW Marriott Mumbai Juhu and Courtyard Mumbai. If I’m not mistaken, the participating hotel benefits offer up to a 20% discount on accommodation and a 20% on the food and beverage bill. Unlike most cards, the Club Marriott membership is valid across Asia Pacific. My friends had lined up a few travel plans to Australia and New Zealand soon after their wedding and were able to avail a 20% discount on their food and beverage bill and room stay during their visit as well as a 20% discount on weekend leisure rates at some Marriott hotels. It was only after my friends came back from their travel did they tell me about the membership helping them cut a deal throughout their trips and how thankful they were for the gift. Now they are planning a trip to Goa with Club Marriott. It seems like the membership will take them through the 1st year of their wedding. Not just for weddings, but I believe that the Club Marriott membership is the most thoughtful gift for any occasion. It’s like gifting people a year long of memories they can cherish forever. Marriott is a very big name in the hotel business and after the Starwood acquisition it has become the largest hotel company in the world. In India too, it is now the largest hotel company by number of rooms. Encompassing a staggering portfolio of 30 international brands, Marriott caters to a wide spectrum of customer profiles and preferences. Marriott recently launched the new Club Marriott membership in India and Asia Pacific. Now combined with the Eat Drink and More membership of the erstwhile Starwood Hotels, the new Club Marriott membership is now even more powerful and beneficial to its Members. Being able to use one card across a select portfolio of Marriott hotels across Asia Pacific, such as JW Marriott, Renaissance Hotels, Courtyard by Marriott, Westin, Sheraton and Le Méridien among others was something that caught my attention in an instant. Hence, I got my first Club Marriott membership to see what the hype was about. Club Marriott brings more joy to all on special occasion, birthdays, anniversaries and other celebration worthy moments. It allows you to the make the most of every moment without burning a hole in the pocket. Having used the membership for a while now, I can say that with Club Marriott, Marriott Hotels is truly creating a pool of loyal customers and rewarding them for their loyalty through offers at over 250 of their hotels across Asia Pacific. I mean, up to a 20% off on the food and beverage bill and accommodation each time one dines or stays at one of these hotels is a pretty smooth deal. I was wondering if this membership that I bought from a friendly, neighbourhood Marriott hotel gives me so many benefits and absolute value for money, why should I visit another hotel in the city at all? Just to list down a few benefits for any one looking out; a 30% off on food and beverage for up to a table of 20 guests each time you dine, group dining certificates offering up to a 50% off on food and beverage, lifestyle certificates offering limited but an interesting use of the spa, health club and pool. However, the cherry on the cake is really the free room night stay it offers for the perfect staycation. I think this membership brings more joy to all on special occasion, birthdays, anniversaries and other celebration worthy moments. It allows you to the make the most of every moment without burning a hole in the pocket. Club Marriott truly stands by its tagline ‘we bring more to the table’. Club Marriott comes at a basic fee and offers far more than the card value throughout the membership year. You can check them out at www.hotelmemberships.com or at www.clubmarriott.in and get yourself a membership from your next door Marriott hotel. It’s worth every penny. © 2019 TLC Relationship Management Pvt. Ltd. All Rights Reserved.